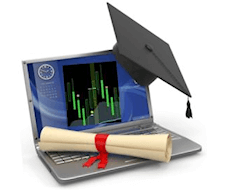 Your Complete Trading Package includes trading software, video training, trading education, and FREE Trade Room. Testimonials and Reviews, Click Here. 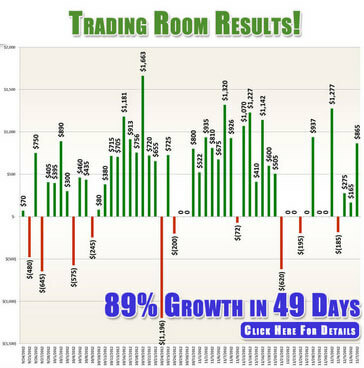 Trading Room Results, Click Here. Why have literally thousands of traders chosen the Diversified Trading System (DTS) since 2009? Trade Futures, Forex, and Stocks with DTS. Early warning trade alerts enable you monitor and trade dozens of markets simultaneously. Straightforward and clear instruction on the software, including all settings as well as many real-time trade examples. Updated monthly. 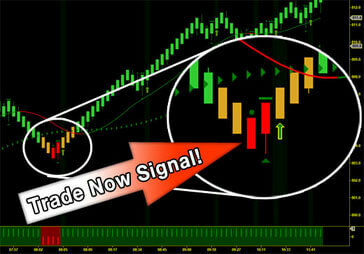 Easy to read charts, clear “trade now” signals and stress-free trade management enable confident trading. You will receive any new versions or upgrades to any of the Indicator Software you own, FREE of charge, forever. 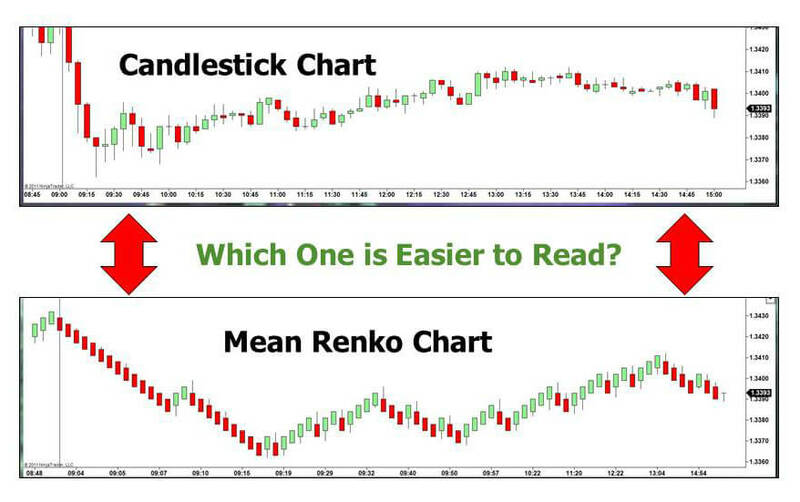 Indicator Warehouse Custom Mean Renko Bars! IW Custom Mean Renko Bars show the correct price sensitivity. In other words, they show you the current limits of the buyers and sellers (i.e., support and resistance) much clearer than a time or tick based candlestick chart. Look at the two charts below. The first one is a regular candlestick chart and the second one uses the IW Custom Mean Renko Bars. As you can see, with the Mean Renkos, it’s much easier to see the trends as well as the limits of buyer and sellers (support and resistance) and that makes it much simpler to see good trading opportunities. Once you know the market “extremes,” you can trade accordingly, either by trapping traders when the market violates the extreme or going with trend when the market confirms that the break of the extreme will hold. Included in your DTS Trading Package, you receive the Trade Manager for risk and money management all in one tool. In addition to automated trailing stops (auto trade management), Trade Manager’s money management component automatically calculates the correct amount of contracts or shares based on your account size or market volatility – and then enables you to place the trade directly from your chart. This method is sensible and smart trading at its best putting the odds on your side for the maximum profit and minimum risk. Trade Manager will not start to manage a trade until it catches up with the first Stop placed when a trade is initiated. 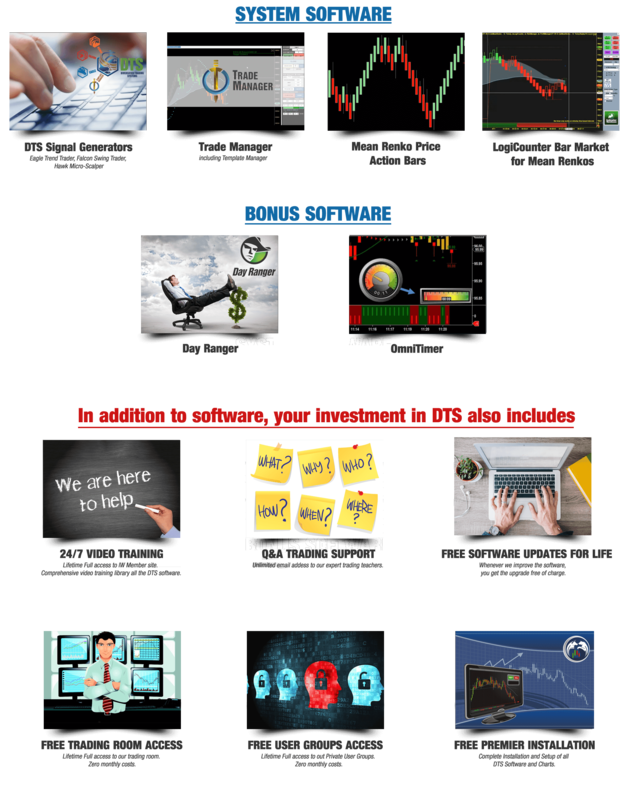 The Ultimate Support and Resistance Suite give you the confidence from knowing precise times for entering and exiting the markets with very Low Risk/High Reward trading opportunities. It’s like knowing in advance what the market is most likely to do next! The Logicounter eliminates the stress of having to set up trades in a rush. With the LogiCounter, you can anticipate your trade, and this enables you to calmly set your stop, the number of contracts and an entry price to enter the trade at the optimal moment. With DTS you don’t have to be staring at the screen all the time. The trading system can alert you to a wide range of excellent trading opportunities. This feature allows you to monitor as many markets as you wish because you’ll hear an audible alert when the system detects a good trade. A “Friendly Warning” dot appears, accompanied by an audible alert. We think you should be very skeptical of any published results unless there’s a way to verify the trades are taken. At Indicator Warehouse, we video every trading session and make these public so you can see for yourself the trades made, managed, and exited. The Steps to Profitable Consistency! All three DTS “Bird” systems give you the maximum number of quality “trade now” signals for scalping, swing trading, and trend trading. 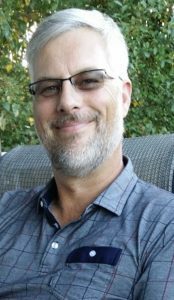 Our technician will install all of your System software FREE of charge on your computer and answer any setup questions you may have. You will receive access to our private training video library. Instructions on all of your software settings as well as in-depth training on how to trade with DTS and your Trade Manager money management software. $9,995 worth of Software and Services for only $2995. All of our software has been thoroughly tested by our in-house team and a select group of customer traders. We are happy to fix any technical problem related to software programming free of charge. Rest assured, this rarely happens. Markets tend to move a certain amount during a 24-hour period. The bonus Day Ranger software gives you a display of the different day ranges – current day range, yesterday’s range, the five-day range, the 10-day range and the 30-day average range. Use these ranges to figure out which markets have been exhausted. Has a given market already moved its average amount for the day? If so, the odds are it isn’t likely going to go beyond that. This knowledge helps you decide if you want to enter the market as well as set profit targets and your exit strategy. Know the average true range of what’s on your chart. See the repeating trends of your market. Instantly compare and see which markets are performing within their normal ranges. Having instant access to the historical ranges of your market enables you to trade with more confidence and accuracy. Regular Price on our website: $395 – you get it FREE today. Hello Erich, I just wanted to take the time to say thank you for blessing me with the Eagle, Falcon, and Hawk. They are great to work with I LOVE them I have been trading off and on for ten years now, and I’m happy to say that I don’t have to look any further. Without a doubt, I’m trading so much better and with ease, my stress level is none for the first time. How can I get a copy of NinjaTrader Installed? Click here to get a FREE demo copy of NinjaTrader and real-time market data. For detailed NinjaTrader education and support, please click here to see live training events and click here for other support resources. What about installing my Indicator Warehouse products? No problem! All of our systems come with complete installation and trade setup documentation. In addition, we have optional services to install the software and set up your charts for you via remote connection to your machine and GoToAssist chat. How long does it take to process an order and to send me my new product? Your software will be available for download immediately after you complete your transaction. You can typically expect to schedule a system installation within 24-48 hours. However, during busy periods or at weekends it may take a little longer. 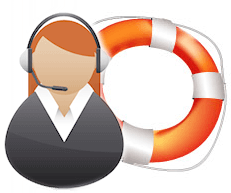 Our Support is FREE (via email)… If you would like us to call you and directly access your computer to address your support request, we also have OPTIONAL “do it for you” options available. May I install my indicator on more than one machine? We have a 1 to 1, license to computer licensing model. In other words, you are entitled to use one active NinjaTrader machine per license. However, additional licenses are available for laptops, etc. at extremely discounted prices. NOTE: No more than 3 licenses per customer. Contact Support@indicatorwarehouse.com for Complete instructions for finding your NinjaTrader Machine ID. What if I need to replace my Machine ID? No problem. For a nominal service fee of $10 per indicator, per machine, we will get everything updated for you. Note: We give volume discounts for 3 or more indicators. No. Short trial times create an artificial pressure to quickly succeed. Trading is hard enough without this added anxiety. Due to our royalty payment structure to our programmer-suppliers, we are not able to do exchanges. Please be advised that all sales are final. No returns, refunds, or exchanges, partial or otherwise, for any reason. Once your order has been placed and your credit card billed or processed through PayPal, there are no returns or credit. You may not return the product and demand a refund, as you were supplied intellectual property in the form of software and copyrighted trading material. 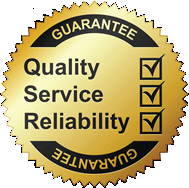 All our products are distributed and licensed on an “as is” basis and no warranties, guarantees, or promises of any kind by Indicator Warehouse as to their performance, reliability or suitability to any given task. In no event shall Indicator Warehouse be liable for any loss of data or ANY DAMAGES OF ANY KIND, financial, physical, emotional or other, which might arise from its use. Federal or local law governs the use of some types of software; it is the responsibility of the user to follow such laws. Any and all purchases that result in a charge back will result in Indicator Warehouse immediately deactivating any and all copies of the software and a deactivation of machine ID’s. Your username will be permanently banned in our database of authorized users. In no event shall Indicator Warehouse be accountable for any or all financial losses or costs from the use of any of our software. Any charge back initiated by the customer will be investigated to the fullest extent, and that customer will no longer be able to purchase any items from our company. Any additional purchases will be refunded immediately. Please do not attempt to make any fraudulent purchases. If we receive any fraudulent charge backs, we will immediately deactivate your copy of the software and prosecute to the fullest extent of the law. May I use your products for Commercial Use? Indicator Warehouse software is intended for personal use only, and may not be copied, redistributed, published, broadcast, circulated or emailed to any friends, clients, investors, or sold to any third party as a part of any commercial service, including trading advisory services or live chat rooms. If you are found to use, or plan to use the indicator in any commercial capacity especially in a competitive nature, your code will be deauthorized and your licensed revoked without refund. In addition, the software has been coded so as to identify the original source client of any cloned or decompiled versions of the software. Original users that are found to have decompiled or cloned or copied any or all portions of the indicator code will be immediately prosecuted to the maximum extent of the law. Which version of NinjaTrader do you support? We provide trading software for use with NinjaTrader versions 7 and 8.